Rosa Parks (born Rosa Louise McCauley on February 4, 1913), who on December 1, 1955 in Montgomery, Alabama sparked a mass bus boycott and became became an international icon of the Civil Rights Movement by refusing to give up her seat to a white man. She continued her activism throughout her life. 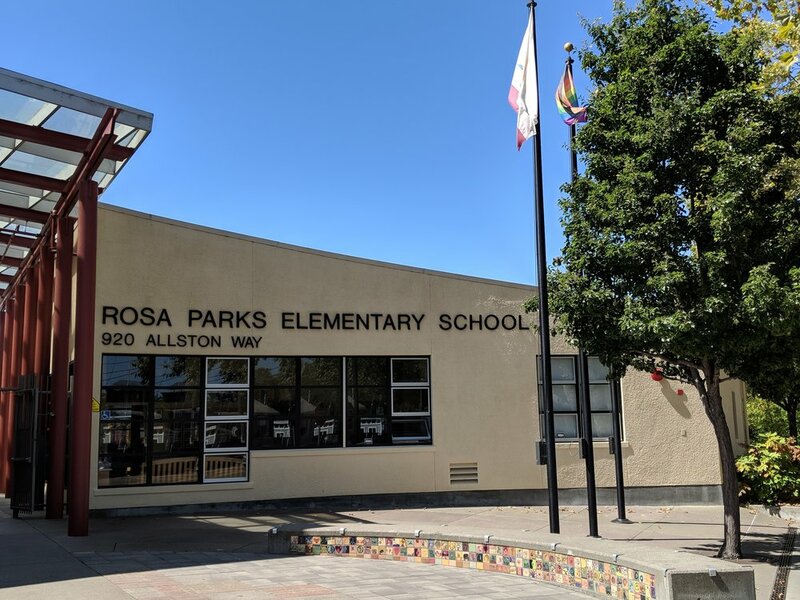 Rosa Parks Environmental Science Magnet School is an elementary school located in the Berkeley Unified School District. The school features a science lab and school garden. Our dedicated, talented faculty and staff, emphasize equity while maintaining high academic standards for our students. Are you a sponsor of a Rosa Parks student? Every student who gets 10 or more sponsors will be a part of a raffle to slime Mr. Furlan! The PTA Board still needs Fundraising Co-Chairs, Hospitality Coordinator, Events Coordinator, and chairs for the Carnival, Silent Auction and Read-a-thon. Our school depends on your talent to succeed! Shop, dine & earn money for Rosa Parks! Stay up to date with our school, sign up for the e-tree!